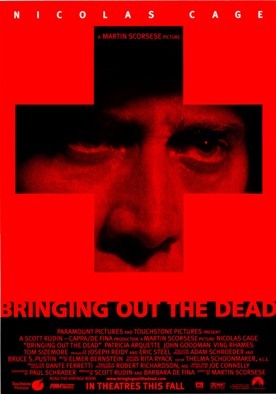 Martin Scorsese's new movie, Bringing Out the Dead is yet further evidence of its director's fascination with the manic personality as well as his undoubted skill with the camera. Unfortunately, those of us who do not share this fascination are likely to find one manic personality looking rather too much like another, and the would-be normal guy surrounded by such personalities in Paul Schrader's script rather too much like a portrait in self-pity. The result is an aggressively New-York movie which, like New York itself, sometimes seems as if it is all attitude and little substance. Of course, he suffers precisely because he does not really have that mania to protect and insulate him from harshness of reality as his various partners do. One of them, Tom (Tom Sizemore) is made to seem genuinely crazy, a man who enjoys the suffering he sees and wants to cause a bit of it himself. But all of them share the craziness of the druggies and suicides and street-people they have to minister to, and it extends to the staff of the hospital and, seemingly, everyone else in the city as well. Frank's one kindred spirit in relative sanity is Mary Burke (Patricia Arquette), the daughter of a heart attack victim who tells him that “Everyone at that hospital's crazy—and I'm crazy too.” But, with Frank, she shares the distinction of being the only one of the crazy people who knows she's crazy. After a brief flirtation with the religious life, her form of craziness was formerly drug-taking. “I wanted to run away,” she tells Frank. “Sister Mary, Mary the junkie; it didn't matter to me.” Now apparently rehabilitated, she relapses under the stress of her father's illness and returns to the pills in a drug den called “The Oasis” run by an oleaginous entrepreneur called Cy (Cliff Curtis). Frank pursues her there and ends up joining her in a drug-induced reverie—which he breaks out of just long enough to carry her home. Later, the Oasis gets shot up and destroyed and Cy impaled on a railing by a gang of street dealers selling something called Red Death—mania in a vial which, like the more general mania of the city, destroys even the drug-made havens there of peace and rest. In the end we can't help feeling about Frank's theatrical fellow-feeling with the wretched social refuse of the big city that, as somebody says to him, “No one asked you to suffer; that was your idea.” Of course we understand that he is supposed to feel more than the rest of us and thus to belong to that aristocracy of feeling that our therapeutic culture has set up for the kind of admiration and emulation it generally receives from the movies. But, as with so many other ostentatious practitioners of compassion, you begin to suspect of Frank and his various creators that the real object of his sensitivity and tender solicitude is his own reputation for sensitivity and tender solicitude.